I guess when you make something for yourself, you can be extra picky because you’re always checking to make certain it fits. This mitten does not fit! –The cuff is wider than the rest of the mitten. Because I chose the flat stitch for the majority of the mitten, the Purl 1, Flat Stitch 1 ribbing is too loose. –I started the thumb too early. I need one more row before starting that thumb. now, it rides up a touch right below the thumb. –The thumb is too snug/short. I should have used more pegs, plus it needed two extra rows. –The top is too long. Now, here I’m getting picky. It’s only about one row too long. So, there you have it. 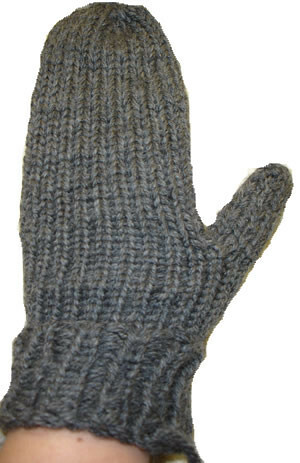 A failed mitten. Poor little thing. I intend on frogging it and starting over, making better notes this time. When I have a finished pair, I’ll do another post. I realized I never posted a photo of my ziggy zag scarf even though I finished it last spring. I’ve been wearing it a lot this fall, and it’s just the right weight for not-so-cold days. I’d like to make a matching headband with the same yarn, but since it’s a little bit scratchy, I’m not sure if I’d like it. I posted instructions on the ziggy zag stitch earlier. The scarf is about 55″ long. It curls a lot, but I don’t think blocking it will help because it only has a small amount of wool. Final thoughts: cool pattern, nice color, but it curls in everywhere but the ends. 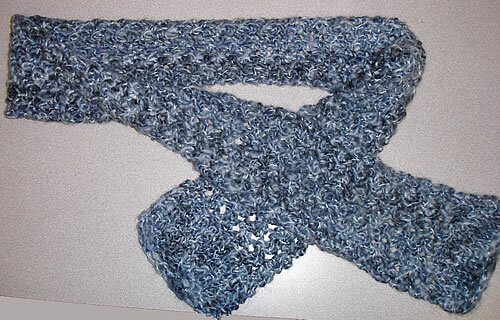 I’m please because this was my first fancy item, but I’d choose a different yarn and probably do a border along each edge the entire scarf.